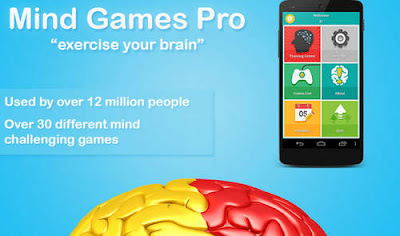 Mind Games Pro is the full, unlimited, ad-free, version of the hit brain training app from Mindware Consulting. It's a puzzle game made to boost your memory and other cognitive skills using various memory, math, and vocab puzzles. The app boasts a wide variety of engaging games with the purpose of strenthening different mental skills. With over 18 different games, puzzle fans are sure to find something they like to spend time on their Android devices. - Math Star; Try to make different calculations within 3 minutes. - Vocabulary Star; You get a bunch of letter sets and some definition and you have to construct the correct word. - Mental Flex; Try to choose between one of two colored shapes with help of prompts and words (see details on the Play Store). - Memory Span: Remember how items were ordered. - Abstraction; Decide if the word describes a concrete or abstract object or concept. - Vocabulary Power; Guess word from its definition. - Changing Directions; Follow the arrow as it moves on the screen. - Anticipation; Pictures scroll and you have to tell if two are the same. - Speed Trivia; Unscramble words to answer trivia questions. Plus 9 more focusing on memory and attention..more details on Google Play. New Face and Object Memory Level 1 games. The German translation was improved in this version. Practice your ability to mentally rotate objects with the great new Mental Rotations game. Fixed issue with crashing for Turkish devices. Learning exercises incorporating memory strategies and Mindfulness are added to this update. New games added: Double Memory, Word Memory Level 2, and Spatial Memory was improved. Crashing issue when opening Games List and Training Center was fixed. Updated scoring data and fixed minor issues. Stay up to day with latest news on brain research with the new Brain News feature. Russian language translation added. Exercise Your Brain! Challenge yourself with the exciting new game called Changing Focus in this release. Also added new age ranges and the ability to turn off comparison scores. Install the app's apk and test your brain!